These are Catholic high schools in the state of Michigan which were once in operation, but were closed. Some are from the very early part of the 20th Century or even the late 19th Century. Click on the name of the school for details. As possible, we have listed the schools by Diocese. * Lenawee and Washtenaw Counties are now part of the Diocese of Lansing. This school started out as Shrine of the Little Flower High School. When I was attending, it was shortened to Shrine High School. Shrine High is now an Academy. When I attended back in the 60's we were just a Catholic High School. The Shrine of the Little Flower is the parish I grew up in, and attended the elementary (1-8) then to the high school (9-12). Shrine of the Little Flower is Fr. Charles Coughlin's parish, he was the radio priest of the 30's. It is still a thriving parish, growing under the current Pastor, Msgr. Easton. Teachers were primarily Sisters of Charity, and they had a Convent at both schools. 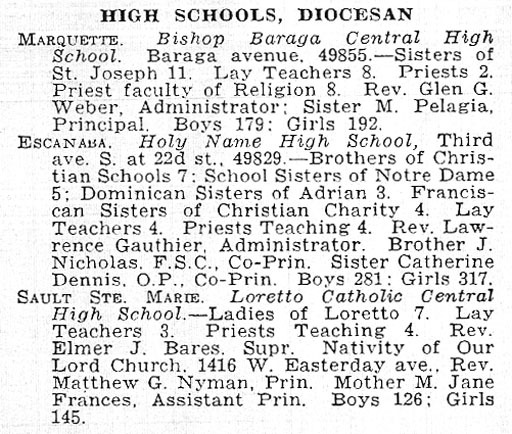 From Michigan native, Bill Blackburn - (Thanks, Bill) Some more information on former Catholic High Schools of the Lansing Diocese. The three you have listed were inter-parochial schools that came into being in the early sixties. Msgr. Gabriels and Msgr. O'Rafferty schools were consolidated into Lansing Catholic Central in 1969-70 or 1970-71 if my memory serves me correctly. These two were preceded by Resurrection Parish High School staffed by the Adrian Dominicans and St. Mary Cathedral High School staffed by the Sisters of Charity of Mt. St. Joseph Cincinnati. My wife and I were graduates of St. Mary. I returned there to teach and coach and eventually got into administration becoming the first lay superintendent of Diocesan Catholic Education in Michigan in 1971. 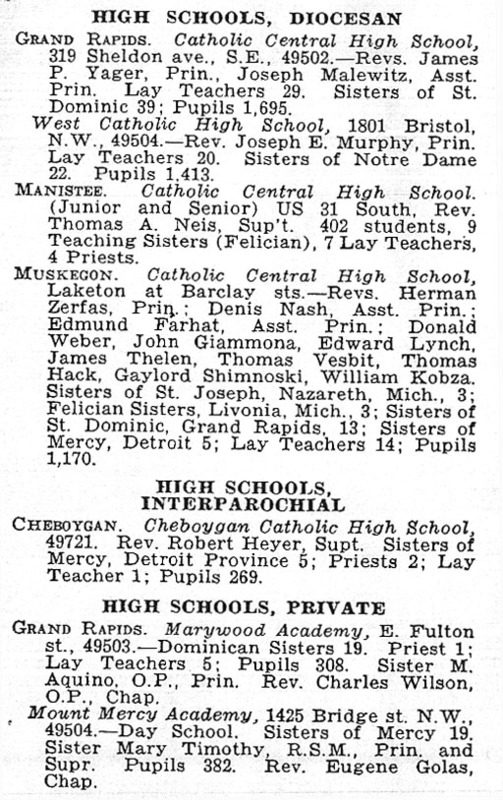 Other Catholic High Schools in the Lansing Diocese were Jackson St. John and St. Mary. They were replaced by the inter-parochial Lumen Christi High School in the late sixties. Owosso St. Paul had a high school that was closed in the early to mid-sixties. Flint had St. Mathew, St. Agnes, Holy Redeemer, and I believe St. Mary high schools prior to the establishment of the inter-parochial Msgr. Powers High School in the early to mid-sixties. I believe that Ann Arbor St. Thomas High School was recently replaced by an inter-parochial school. I also believe that there may have been a girls' Catholic High School affiliated with Sienna Heights College in Adrian that is staffed by the Adrian Dominicans. The Kalamazoo Diocese was formed the day that I was named superintendent in Lansing in July 1971. 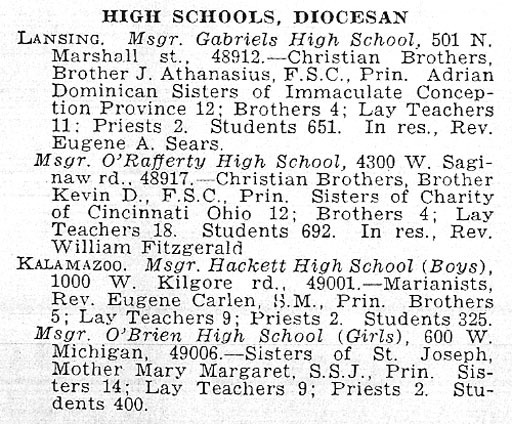 Prior to that time, the Catholic high schools of Battle Creek, Benton Harbor, Kalamazoo, and St. Joseph were a part of the Lansing Diocese. Thinking back on the post Vatican II sixties, the Michigan dioceses were leaders in establishing boards of education that enabled parents to participate in setting policy for the schools. Three of the diocesan superintendents travelled around the country conducting workshops on the formation and role of boards. These initiatives preceded the formation of Parish Councils and provided valuable experience in launching the Councils. The boards then became Education Commissions under the umbrella of the councils. Through a joint effort of Michigan's Catholic, Lutheran, Christian, and Jewish Day Schools legislation was won to provide "Parochiad" to help defray the expense of operating these schools. Unfortunately, a referendum was initiated almost immediately after the legislative victory to amend the constitution and make the aid illegal. This association, known as the Michigan Association of Non-public Schools, still exists today and performs school evaluations and conducts an annual conference for educators. Hackett Catholic Central High School in Kalamazoo. Up until the mid-60's, St. Augustine High School was the only high school in the city and was part of St. Augustine parish. In the mid-60's, that school was closed and O'Brien High School (all girls) was opened on the old St. Augustine site and Hackett (all boys) was opened at a new location. By the mid-80's, O'Brien closed and merged with Hackett, creating the current co-ed high school. St. Philip High School in Battle Creek has been in existence for many, many years. To the best of my knowledge (and research) it has been at the same site and under the same name since it was built. It originally was attached to St. Philip parish as a parish school, but has since become a regional interparochial high school serving families from three Battle Creek area parishes. Lake Michigan Catholic High School in Benton Harbor/St. Joseph, Michigan is located on the campus of St. Joseph Parish in St. Joseph, Michigan and has been the only Catholic high school in the area. It's history goes back to the early part of the last century. Within the past thirty years, it became an interparochial parish supported by three parishes in the area and changed it's name to Lake Michigan Catholic High School.